Apart from the vegetables that we ate and herbal medicines that we used as an alternative for the chemically made, plants can also be used as a cleaning material in our home. I still remember the time when we move in to our apartment last year and we have to remove rust from concrete and hubby uses some chemical stain removers which took a lot of effort if I may add. 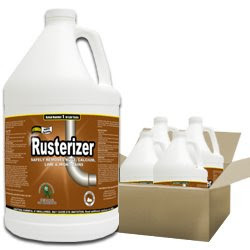 We never discover yet the organic concrete rust remover named Rusterizer which only takes a minute to remove the stains! That's how fast and convenient it was. Plus the fact that is made by natural ingredients (which can be found in the remote areas of Peru and Brazil), making it safe to be used by anyone from your family. Even children will enjoy cleaning the concrete rust at your home. I think it's about time that we go organic one step at a time. Let's start by using eco-friendly products in our own home then start eating organic food every once in awhile. It will do us good in terms of health and of course it's more affordable compared to the industrial products and meat processed foods that are out on the market.